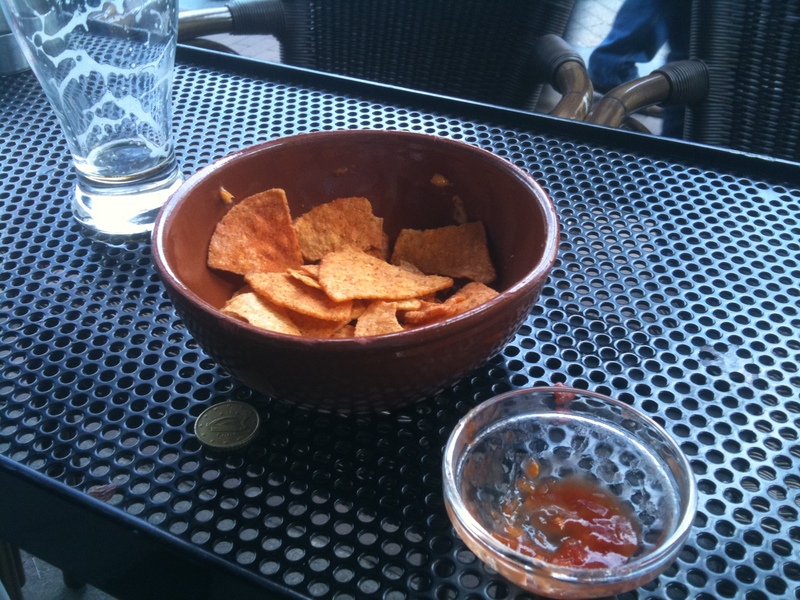 Temple Bar Cafe (Klovenierburgswal Centrum, Amsterdam): AmsterDAM, these nachos are terrible! Today’s review is brought to you by the newest division at Nacho Patrol World Headquarters, Parental Patrol. In other horrifying news, our parents are learning how to blog. Ahhh!!! Enjoy! First let me thank and curse Nacho Patrol for inspiring me to try nachos in odd places- ie, anywhere outside a bar in North America. So far, I have had nachos in Venice, Vienna and Mumbai, and now, Amsterdam. With emphasis on those last three letters…..
We had a one-nighter in Amsterdam on our way home from Europe. We dropped off the bags, zipped into the city, and realized we were hungry. Bought a wurst of sorts at the market, then spotted Nachos on a bar menu and knew this was the ever-so-flimsy excuse we needed to grab a seat, order up some brewskies and try Dutch Nachos. Let’s just say the beers were great. The “nachos” were those south-of-the-border spiced Dorito chips, only somehow thicker, with your standard movie-theatre orange cheeselike sauce pumped over. They did go to the extra effort to pump this substance onto several layers of Doritos in the bowl, so that you could appreciate the mediocrity all the way down to the bottom layer of chips. There was a little bowl of something red that must have been their stab at salsa. Why does Europe insist on pureeing all salsas? Verdict. Not even an excuse for nachos. Just doritos with imitation cheese sauce and imitation salsa. Nice locale, nice beers, wonderful people watching. Saw a bike saloon that looked like a lot more fun than these nachos. Giving these nachos a number is an insult to nachos everywhere. 0/40. 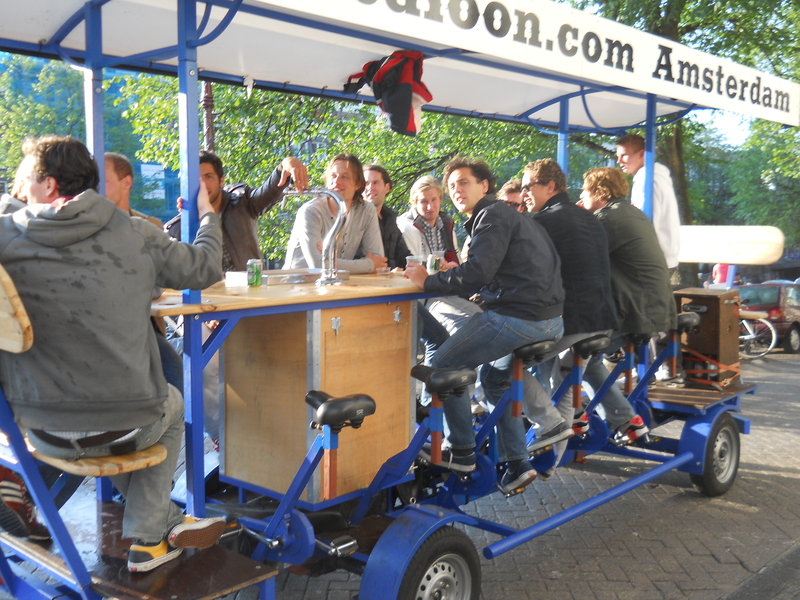 Hop onto the bike saloon instead, enjoy the beer, and stick to what the dutch do best–biking, drinking, and talking in a language that involves a lot of involuntary spitting. Tags: Amsterdam, Beer on a bike, Disaster, Doritos, Dutch, What is with Europeans? ← Telegraph Hill: Good Nachos. Stop. Too Expensive. Stop.